Despite the widely publicized influx of grass roots help to crisis-hit areas, Russian volunteers are still facing a real battle to mobilize and to change minds. 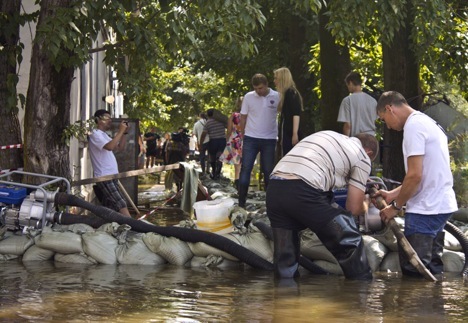 When a devastating flash flood killed 155 people in the southern Russian town of Krymsk in July 2012, it was a summons for journalist Dmitry Aleshkovsky, who joined hundreds of volunteers flocking to the area. When Aleshkovsky created the "Nuzhna Pomosh" (Need Help) project in September 2012 to bring volunteers together, he was tapping into a trend that was taking Russia's creative class by storm: if you couldn't change your government outright by protesting, you could start making a difference by volunteering - whether it was signing up to monitor local and federal elections, joining search teams looking for missing children, or helping flood victims. Through efforts like those of Aleshkovsky, volunteers managed to raise 3 million roubles for victims of flooding in the Far East last month. But despite the widely publicized influx of grass roots help to crisis-hit areas, Russian volunteers are still facing an uphill battle to mobilize and to change minds. While volunteer activists see an increasing number of people eager to get involved, statistics still suggest that Russians are less likely than their neighbours when it comes to helping people they don't know. And while that is beginning to change, experts say it will take a long time for volunteering to become a cultural norm. “Their scale is still so small that volunteer organizations emerge and become visible only during times of emergencies or crises, fires, or floods, or protests,” Denis Volkov of the Levada Centre polling organization told The Moscow News. Figures differ depending on how pollsters qualify volunteer work, but most of the numbers reflect a lack of institutional networks for volunteers. According to the Center for Studies of Civil Society and the Nonprofit Sector (CSCSNS) at Russia's Higher School of Economics, only about 3 percent of the population is involved in volunteer work through non-commercial organizations, based on CSCSNS polls from 2011 among 41,500 respondents. According to Denis Volkov of the Levada Center, in fall of 2012, only 1 percent of respondents said they had been involved in volunteer work through NGOs. Findings differ depending on whether respondents are talking about formal involvement through NGOs, or informal involvement, according to CSCSNS director Irina Mersiyanova. The Russian division of the Charities Aid Foundation estimates that about 21 million people in Russia volunteer both formally and informally, based on findings from 2011 Gallop polls among at least 2,000 respondents. That was still less than 15 percent of the population. By comparison, the United States scored seventh on a CAF rating of volunteers by population share with 42 percent. Turkmenistan, Liberia and Uzbekistan topped the list, with 58 percent, 53 percent, and 46 percent of respondents respectively saying they had volunteered in the last month. Sociologists point to the Soviet Union, in which public efforts were largely centralized and controlled by the Communist Party, as the reason for the lack of initiative. But according to others, despite notions of Russian society as collectivistic, active volunteering was never a major feature of public life. While Russia's government leaders praise volunteer efforts, volunteer activists say their actions are harming grass roots organizing. The law that forces NGOs with foreign financing to register as foreign agents, which was passed late last year, has led to searches at hundreds of NGOs and to increasing distrust. Meanwhile, in early 2013, a law was introduced into the State Duma that would regulate the work of volunteers. Local red tape is also a problem. Yevgeny Grekov, who launched an unregistered group called Volunteers on Wheels, said that local volunteers in his home of Krasnodar are complaining that they cannot enter orphanages without permission from the Education Ministry. Although attitudes towards volunteer workers are generally positive, “the moment there's any [suspicion of] American funding, then that's it,” Volkov said, indicating that distrust towards such efforts increased when it was associated with foreign funding. For Aleshkovsky, however, some of the biggest challenges come from within.